Watch out, Mom. He'll be bigger than you in no time. In just over a month, the baby giraffe that gained a following when his mother, April, was pregnant with him, is growing up big and strong. Tajiri (Swahili for "hope") is now 6-foot-4-inches tall and 200 pounds. The baby stood at 5-foot-9-inches tall when he was born on April 15. He is happy and doing well with April and his dad, Oliver, at Animal Adventure Park in upstate New York. 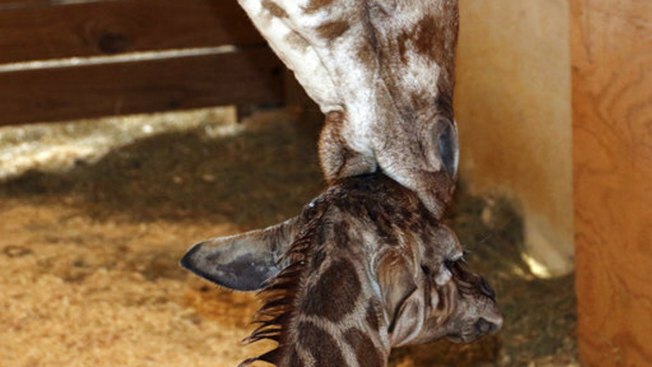 The zoo is open seven days a week from 10 a.m. to 5 p.m.
April gave birth to Tajiri on April 15 at the privately owned zoo. It was her fourth calf, but the first for Oliver. Visitors are expected to flood the zoo for its fifth season after April's pregnancy became the second most livestreamed channel in YouTube history, with more than 232 million live views during a seven-week period.